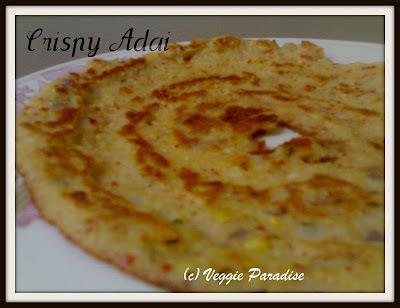 Adai is a healthy,protein rich diet as it contains lentils. This is one of the traditional south indian recipe served with aviyal. Soak rice and dals in water for about 4 - 5 hrs. First grind the ginger and garlic,now drain the water from the soaked dals, grind them coarsely with red chillies and salt .Chop the onions. Add aniseed, curry leaves and the chopped onions to the batter and mix well. Heat a griddle. Pour a ladder of blatter on the griddle and make a perfect round shape. Make a small hole in the centre of the adai. Sprinkle oil on to its sides and in the centre. When they turn golden brown, flip to the other side and sprinkle some oil. iரொம்ப அருமை அருனா பார்க்கவே மொரு மொருப்பாக இருக்கு. lentil dosas sound so healthy..
Crispy & Inviting Adai.. looks perfetc and delicious.. nice click!! Perfect adai and a nice click to go with it. 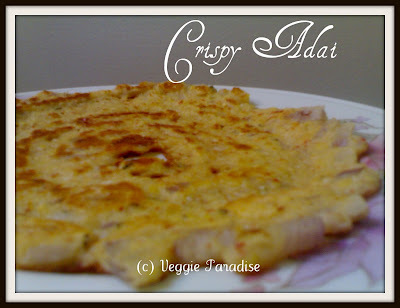 Crispy adai makes me hungry...yumm!! so yummy..one of my fav!!! Nice. I don't make so many varieties of dosas but thanks for inspiring new ideas..
Adai looks delicious Aruna. super breakfast. Oh Aruna, the adai looks fantastic...so simple and well captured. Luvthe color. its very healthy dosa.i do remember one of my good friend she used to prepare thing for me when i was expecting. One of my favorites, looks crisp and inviting !